Pronounced as "fee-jo" this small egg-size and oval-shaped tropical fruit is native to South America but grown in temperate climates throughout the world. The greenish-blue outer skin is thin and somewhat rough surrounding a dense, cream-colored soft flesh that has a center with small seeds. The inner pulp of the Feijoa provides a fruity, somewhat tart flavor with a hint of pineapple, pear, strawberry, and banana flavor. The Feijoa can ripen at room temperature, but will not last long once it is ripe or it can be stored in a refrigerator for a day or two when ripe. When served fresh or cooked in salads, in mixed fruits, sauces, or pies, this fruit provides a refreshing flavor. 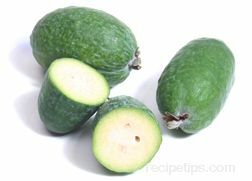 The Feijoa can also be pureed for use in fruit beverages. Feijoas are often mislabeled or referred to as guavas or pineapple guavas, however, they are not a guava, despite being similar in many respects. When selecting choose those that are softer feeling. The green coloring of the outer skin makes it difficult to determine the ripeness of this fruit. When cut open, the inner flesh will expose a jelly-like substance surrounded by firmer flesh that is often used as an indicator of the ripening fruit. If the jellied area is completely clear in appearance, then the Feijoa is ripe. When an opaque or white color is present, the fruit has not ripened or if displaying a browning appearance, then the fruit is over ripe. The Feijo can be sliced open and eaten with a spoon, similar to a kiwi if eaten out of hand. The outer flesh will be more firm than the jellied center, requiring a little more effort to cut through the flesh which will have a texture somewhat like an apple or a pear.